We spent a few days in Philly with my in-laws after our trip to Belize was canceled. We went down on Dec. 28th and came back yesterday. And we had a great time, but the highlight was definitely the food. There’s some good eating in Philadelphia! Also, we couldn’t find the battery charger for our small point-and-shoot, and the screen on my camera is acting weird (fix this recurring problem, wouldja Canon?). So all photos from this trip were taken with my iPhone. And my stepmother-in-law has a thing about cell phones and cameras at the table, so I couldn’t take any pictures of the actual food we ate, either. So…this is going to be more of a Use Your Imagination post. But I always like reading about good restaurants people have been to so I have suggestions if I ever find myself there. I figured we’d just muddle through. Anyway, back to the FOOD. We went to Chinatown and ate at Penang’s Philadelpia outpost, which was so delicious I’m still thinking about the Spare Rib with Noodle Soup I had. Our hotel was just a few blocks from Reading Terminal Market, a spot that I adore. So I took everyone over there for lunch the first day. And they loved it, as I expected. I introduced Adam to more of the delights of the Flying Monkey, too. Those cake balls are the stuff of addiction. We had a super delicious dinner at Sotto Varalli (Upstares was closed until NYE, and we were there on the 29th!). 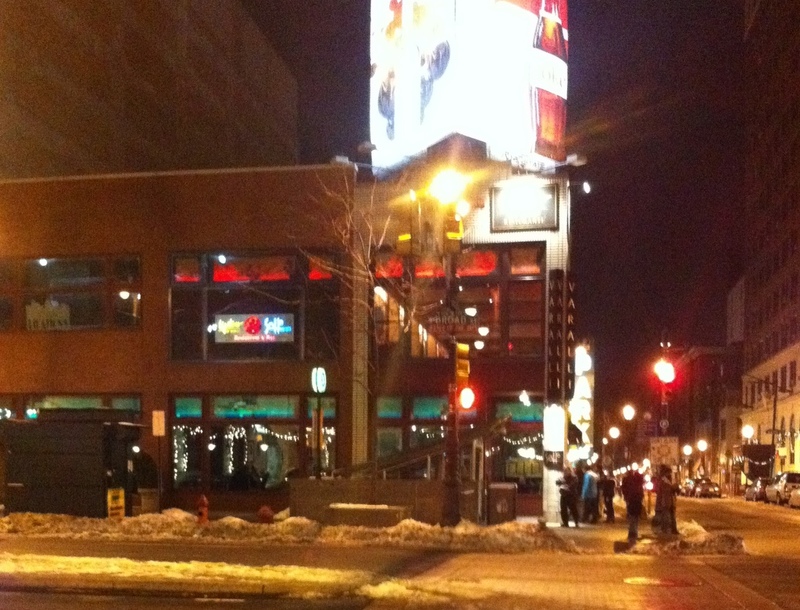 Here is a terribly wobbly photo taken from across the street post-dinner, but trust me when I tell you it was fabulous. And it had possibly the most fabulous waitstaff in the history of dining. I loved this place, and the Veal Piccata was delish. The 30th was my in-laws’ 20th wedding anniversary, so they wanted to take us all someplace special. 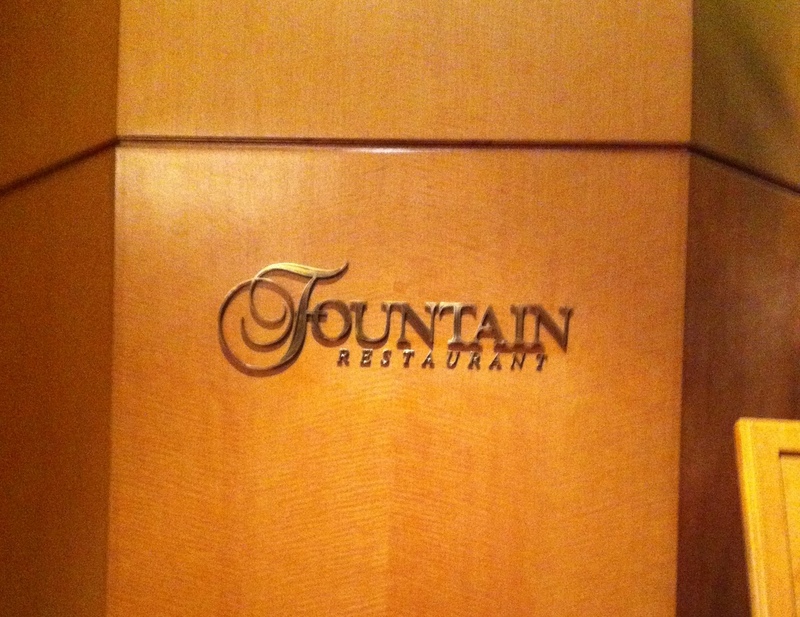 So we went to the Fountain at the Four Seasons, and it was definitely special. It’s a Jacket Required kind of place, but so yummy. Potato and leek soup with a duck confit pierogi and foie gras butter? Oh, go on then. Lobster and celery root hash under the filet mignon? Speaking my language. It was fantastic. 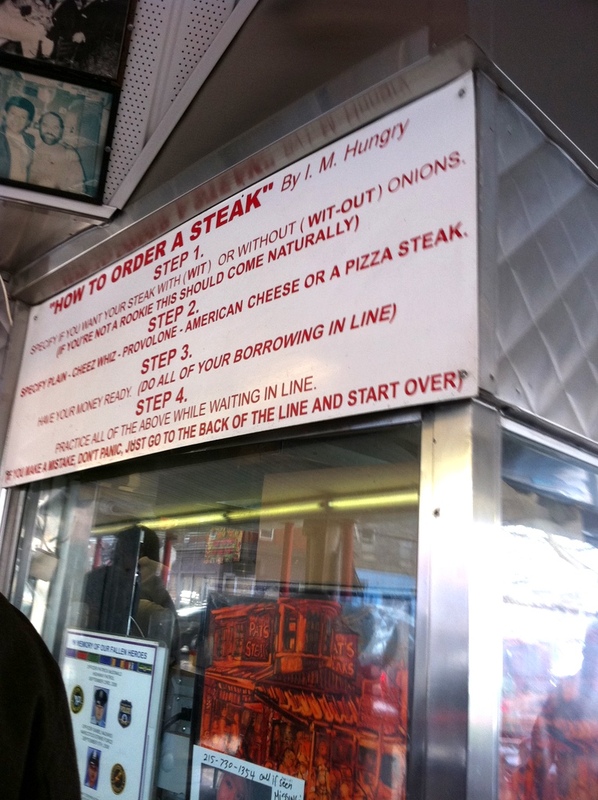 And obviously I would have been remiss if I didn’t take the family to Pat’s and Geno’s for some proper cheesesteaks. We went on NYE. I am firmly of the Pat’s camp, and I’ve been trying to lure Adam down there for ages to try one. He didn’t think he was really much of a cheesesteak person (he had some chicken cheesesteak number at Reading Market and thought he’d had his fill). In response to this, I have now officially proven to him that he’d just never really had a cheesesteak. He’s completely addicted. We walked over to Geno’s, but no one was really in the mood after having the original (and still the best) over at Pat’s. And of course we topped off our cheesesteak lunch with a steak dinner feast at The Prime Rib, where my brother-in-law Thomas had the most obscenely large piece of prime rib in the history of time. And I had a hot fudge sundae to cap off the day. Why, how do you celebrate New Year’s Eve?